Native advertising has a trust issue. The entire reason the so-called “church and state” rule in journalism exists (keeping editorial independent from advertising) is to protect the integrity of the journalism from the corrupting influence of advertisers. However, old media paradigms are falling apart left and right and Native Advertising, which is often seen as a business model that might save the media, is flattening the wall between church and state at publications as revered as the New York Times, the Wall Street Journal and more. But survey after survey shows that the majority of audiences don’t trust sponsored content. One solution is interactive data visualization. By giving readers all the data, they are able to see not just the story your editorial process might uncover, but instead, they can find their own stories in the data. This is incredibly empowering. For instance, in this interactive data experience created for Strategy&, a management consulting firm (part of PwC.) They had done a study about mergers and acquisitions deals that found that M&A works best when the two companies have what they call a “capabilities fit”. 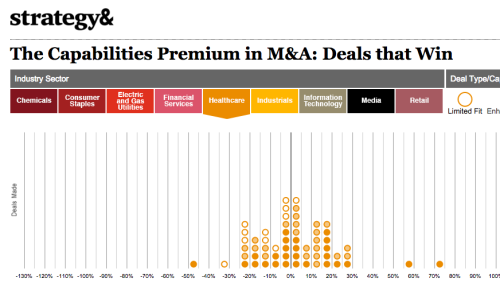 In this interactive, you can see all of the supposedly “good” deals (the dots with fill colors) tend to fall to the right of the middle line — they made money for shareholders. And you can see the bad deals (dots with no fill color), which fall more to the left. But you can click industry by industry and see those that fulfill the promise of the study (like IT) as well as those that do not at all adhere to the theory (like Utilities.) This was not created as a native ad, but if it were, someone from the Utilities industry would be more likely to believe the premise of the research not in spite of seeing the truth in the data but because of it! While the CEO in that industry might still do one of the “bad” deals, he would do it believing that maybe his industry is immune from what he might still believe is an overall truth in different industries. Native ads have a trust problem. But for those businesses looking to leverage this powerful way to reach audiences with great content, I recommend using interactive data visualization to do so because the truth, the whole truth and nothing but the truth is a great equalizer. As a VisualMatters.com reader, Bill is offering 50% off his Udemy online Data Storytelling course. Register now!